Continuous positive airway pressure, also called CPAP, is the most common medical therapy for obstructive sleep apnea, or OSA. The CPAP device is a machine that provides a constant stream of air pressure which keeps your breathing passage open while you sleep. 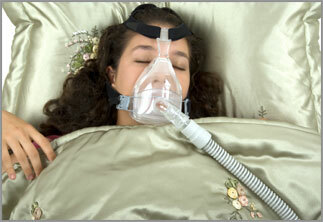 Patients using CPAP can choose from a variety of face masks. These masks are connected to the CPAP unit by tubing. This device is non-invasive and found to be effective. The mask must be worn every night while you are sleeping to achieve the desired result of improved sleep. CPAP users require lifetime treatment. In other words, you must wear the mask every night to protect your airway from collapse. Every night that you do not wear the mask, your airway will be at risk of obstructing and your symptoms will return. Side effects of CPAP include nasal congestion, headaches, skin irritation, dryness of the mouth, nose and throat, abdominal bloating, and an inability to sleep peacefully. Life-long compliance with CPAP has been reported to be less than 50%. The key to preventing serious health complications is to use the device throughout the night. Thus, if you are being treated with CPAP, it must be used faithfully. If not, you should seek another treatment option to prevent airway obstruction. Oral appliances may also be considered for patients with mild to moderate OSA. These devices are offered to patients who cannot tolerate or do not respond to CPAP therapy. 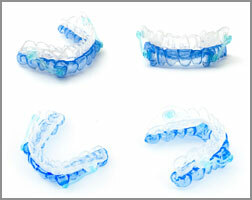 Oral appliances are removable devices that open your airway by bringing your lower jaw and tongue forward during sleep. The appliance prevents the tongue from “falling back” into the airway and causing obstruction. Oral appliances are generally well tolerated, but can cause muscle pain, temporomandibular joint disorders (TMJ), headache and a misalignment of the teeth with long-term use.